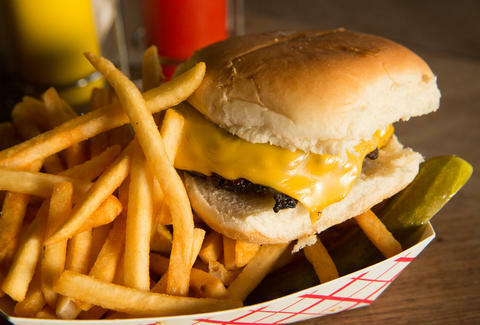 There are plenty of great places to get a cheap sandwich in Ridgewood, but there’s no better classic cheeseburger than the one served for just $7 at Onderdonk & Sons, a quiet, working-class bar on the corner of Onderdonk Ave and Menahan. Onderdonk & Sons has all the elements that make Ridgewood an ideal neighborhood for those looking for a refuge from overpriced, cramped Manhattan bars and restaurants. On warm nights, you’ll find small groups of friends and regulars sitting on the narrow patio catching up over pints. Inside, the padded booths, comfortable chairs, and buzz of low conversation make the bar feel like a timeless neighborhood watering hole, welcoming even to newcomers. The high seats at the bar are always filled with a healthy mix of older barflies, the young and bearded, and a surprising number of people reading -- and not on their phones. The kitchen here may be small (as far as food goes, it’s pretty much just the signature burger & fries combo), but the burger is truly one of the tastiest and cheapest in the city. It’s a totally bare-bones, juicy bar burger, cooked to your liking, topped with either American or cheddar, with no add-ons or substitutions beyond the standard fixings. Sitting at that dark wooden bar, a warm cheeseburger in one hand and a cold beer in the other, surrounded by the kind of people who would never, ever spend $16 on a hamburger, Onderdonk feels like a place completely removed from New York City. Molly Lynch is an editorial production assistant at Thrillist who has been known to cross borough lines in search of a good burger. Follow her on Twitter and Instagram.